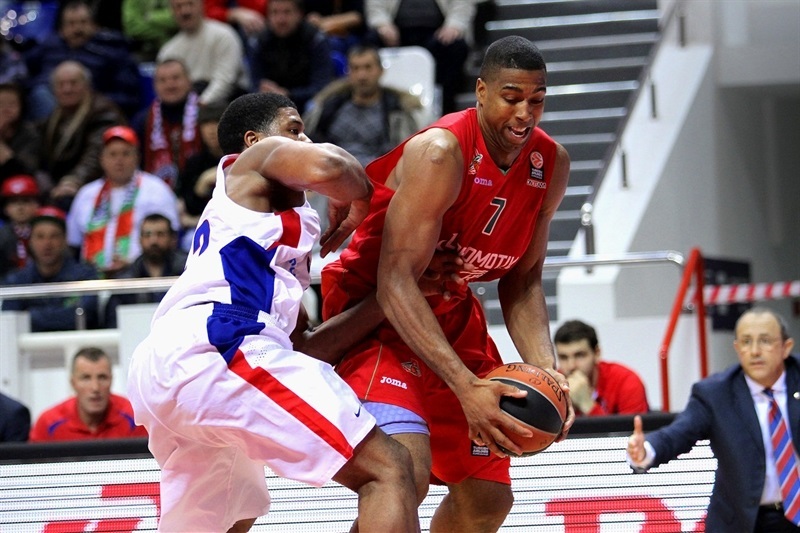 In the first-ever all-Russian showdown in the Turkish Airlines Euroleague, CSKA Moscow grabbed a good-as-gold road overtime win by downing reigning Eurocup champion Lokomotiv Kuban Krasnodar 77-84 in Group F on Friday. 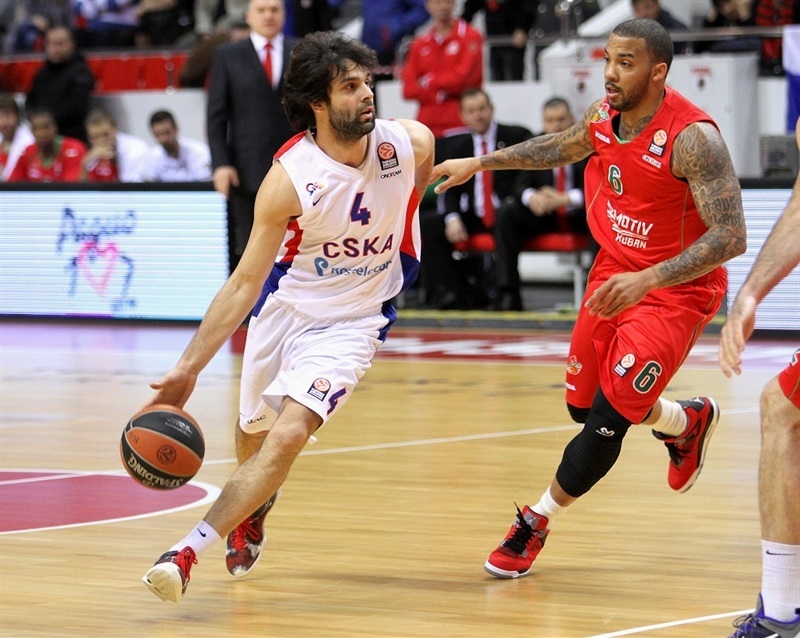 Milos Teodosic paced the winners with 16 points. 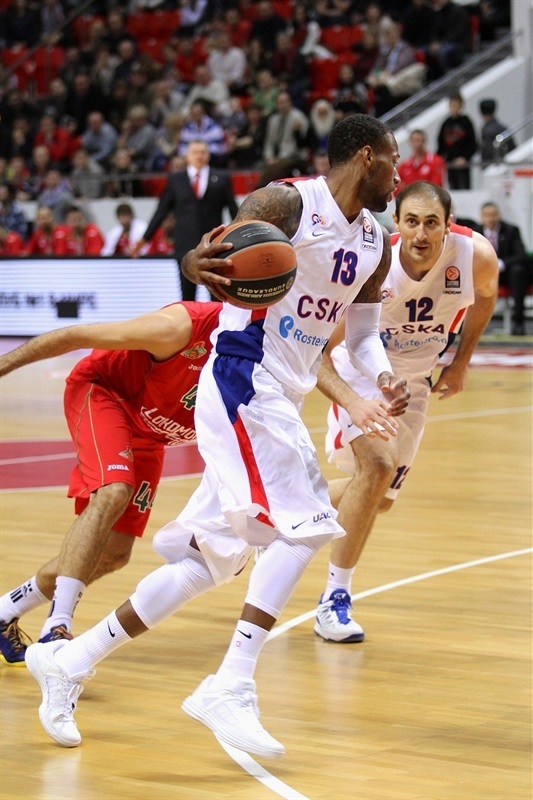 Vitaly Fridzon and Victor Khryapa each added 15, Sonny Weems had 14 while Nenad Krstic scored 11 for CSKA. Khryapa added 8 rebounds, 7 assists and hit 5-of-6 three-point shots in an impressive all-around performance. 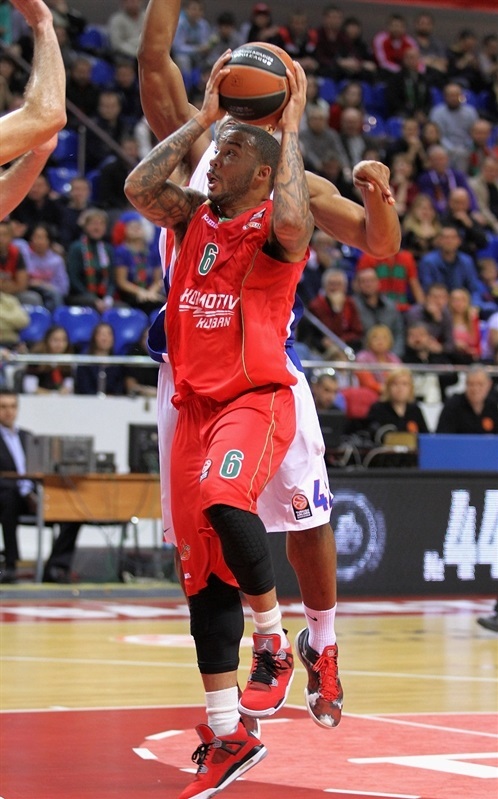 Derrick Brown and Valery Likhodey led Lokomotiv with 13 points apiece. Aleks Maric added 12 and 10 rebounds, Andrey Zubkov scored 1 and Marcus Williams tallied 10 points and 8 assists for the hosts. Brown and Maric fueled a 9-0 run that Krunoslav Simon capped with a wild three-pointer for a 20-19 Lokomotiv lead. 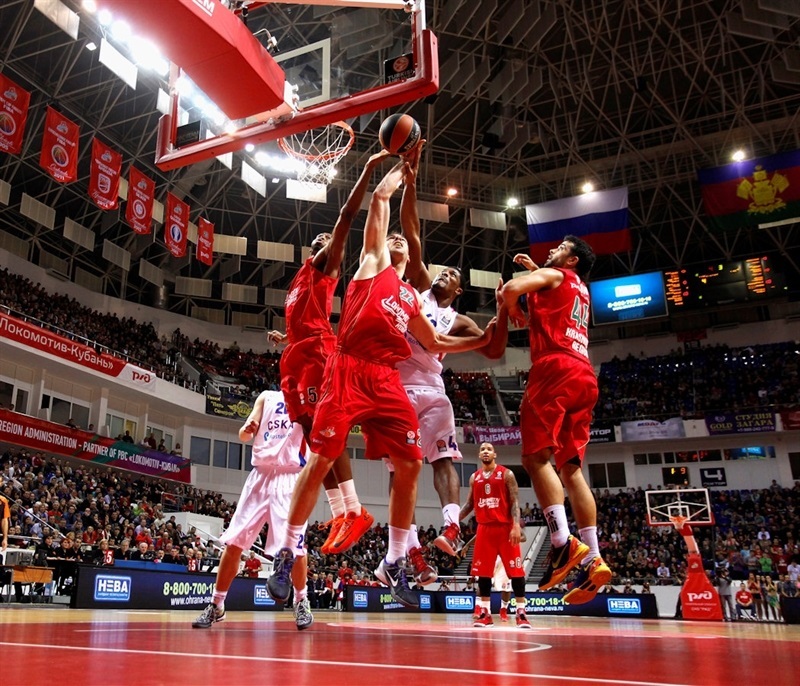 CSKA improved its defense and a 2-12 run that Weems capped with a floating jumper gave the guests a 22-31 edge. Three-pointers by Zubkov, Williams and Likhodey helped Lokomotiv move in front 44-41, at halftime. CSKA improved its defense after the break, as Fridzon and Teodosic led the guests to a 56-57 edge after three quarters. A one-handed turnaround jumper by Richard Hendrix and a wild three-pointer by Likhodey helped Lokomotiv to force overtime, 71-71. Once in the extra session, Teodosic took over and a three-pointer by Vladimir Micov sealed the outcome in the final seconds. Fridzon got CSKA going with a layup in transition and bettered Brown's six-meter jumper with a bomb from downtown to give his team a 2-5 lead. Nenad Krstic scored down low, but Brown ignited the crowd with a two-handed slam in traffic. Khryapa nailed a three-pointer from the left wing before Williams copied him at the other end to keep Lokomotiv within 7-10. Brown shined with a fast break layup. Khryapa beat the shot clock with his second triple. After Mantas Kalnietis scored in transition, Milos Teodosic sank a shot and a step-back jumper by Weems gave CSKA an 11-17 edge. Krstic hit a turnaround jumper, but Brown scored again and a layup by Matic kept Loko within 15-19. Brown took over with a put-back slam and a seven-meter bomb by Krunoslav Simon gave the hosts their first lead, 20-19, after a 9-0 run. Fridzon rescued CSKA with a triple. Richard Hendrix scored in the paint. A jumper by Jeremy Pargo put CSKA back ahead, 22-24, after 10 exciting minutes. Khryapa fed Kyle Hines for a two-handed dunk and buried his third three-pointer for a 22-29 CSKA margin early in the second quarter. Lokomotiv kept struggling to score and a one-handed floater by Weems forced the hosts to call timeout down 9. 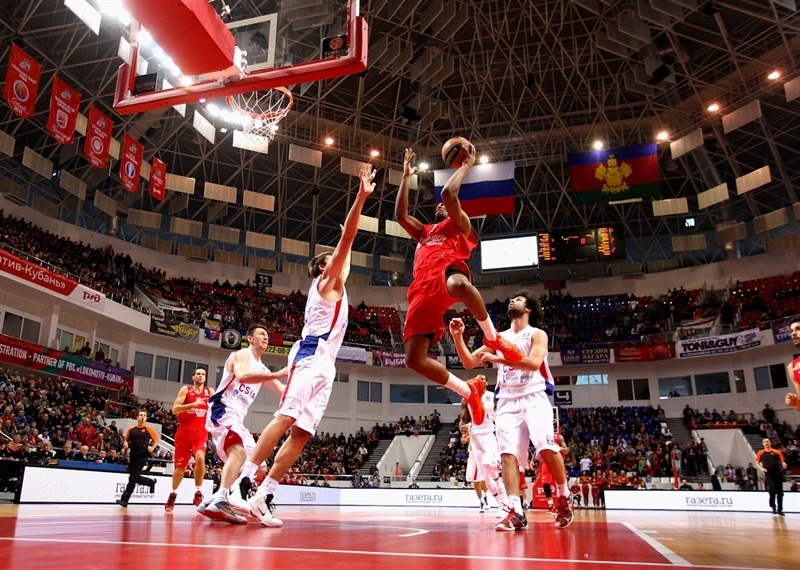 CSKA excelled on defense, playing physical with Khryapa and Hines under the baskets. Maric tried to change things with back-to-back baskets. Zubkov took over with a triple that Khryapa erased at the other end. A three-pointer by Teodosic soon restored a 30-37 CSKA margin. Simon ignited the crowd with a wild three-point play and Williams struck from downtown to bring the hosts within 1. After Hines dunked, Maric hit foul shots and a corner triple by Likhodey completed Lokomotiv's comeback, 41-39. Zubkov hit another one from beyond the arc, but a close basket by Weems kept CSKA within 44-41 at halftime. Weems nailed a three-pointer immediately after the break to tie the game. Lokomotiv struggled to get Brown and Maric involved and was held scoreless for more than two minutes. Meanwhile, Fridzon downed a corner triple to put CSKA back ahead, 44-47. Brown stepped up with a dunk and a backdoor layup by Maric restored a slim Lokomotiv lead. Weems hit a mid-range jumper that Simon improved on with a three-pointer. Teodosic scored in transition and found Fridzon for a jumper, but a three-pointer by Williams gave the hosts a 54-53 lead. CSKA struggled to score and tried a more powerful lineup with Hines and Krstic together on court. 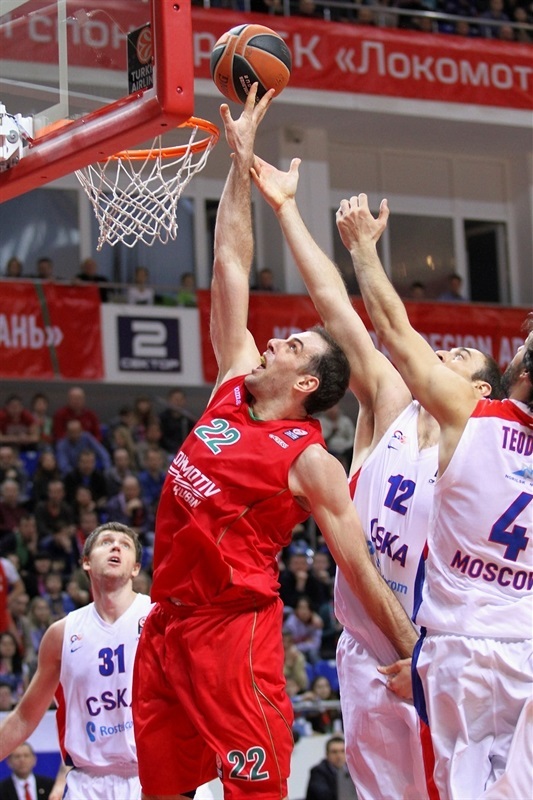 Krstic rescued the guests with a jump hook, as Lokomotiv could not find the way to the basket now. CSKA held Lokomotiv scoreless for more than four minutes. 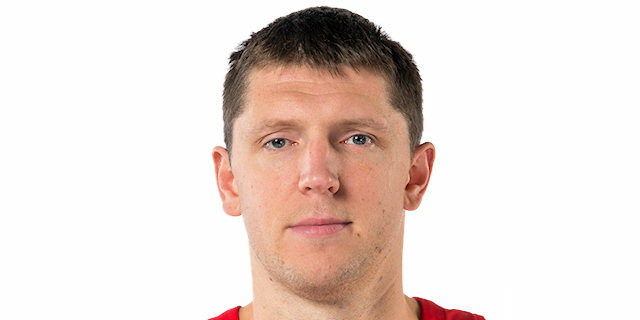 A driving layup by Andrey Vorontsevich gave CSKA a 54-57 edge. A dunk by Maric fixed the score at 56-57 through three quarters. Hines downed a jumper early in the fourth quarter, but Likhodey stepped up with a six-meter jumper, bringing Lokomotiv within 58-59. Zubkov buried a catch-and-shoot jumper and soon added free throws to make it 62-59. Krstic scored in the paint off a timeout and Weems followed that with a step-back three-pointer that put CSKA back ahead, 62-64. Zubkov split free throws and a layup by Hendrix gave Lokomotiv a 65-64 edge with three minutes to go. Hendrix split free throws before Teodosic tied it at 66-66 with over two minutes remaining. Fridzon hit foul shots and a one-handed turnaround jumper by Hendrix tied it again, 68-68. Krstic drew a foul and split free throws with 40.9 seconds to go. Simon missed a driving shot and more foul shots by Krstic made it a 3-point game. Likhodey downed a three-pointer to tie it again, 71-71, with 25.1 seconds to go. CSKA had a chance to win the game at the end of regulation, but Teodosic missed a long three at the buzzer. 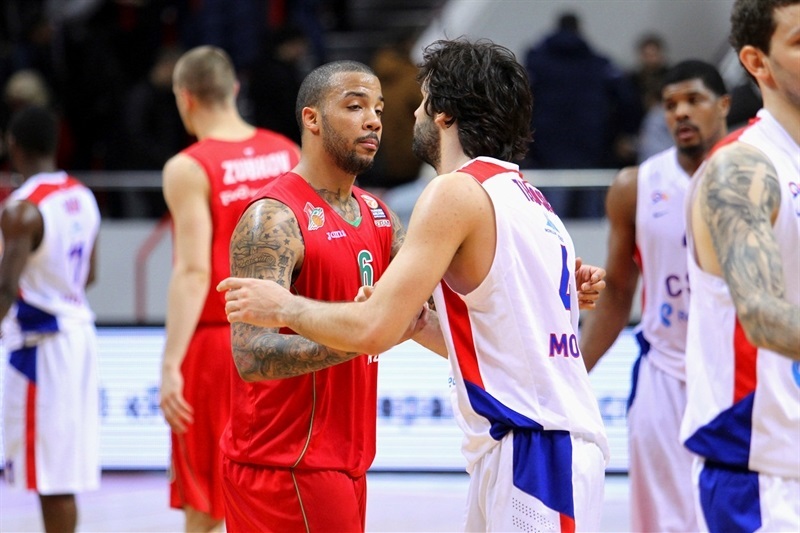 Likhodey struck again from downtown early in the fourth quarter, but free throws by Teodosic kept CSKA within 74-73. Lokomotiv kept running its offense through Likhodey, who missed foul shots. A jumper by Teodosic gave CSKA the lead. 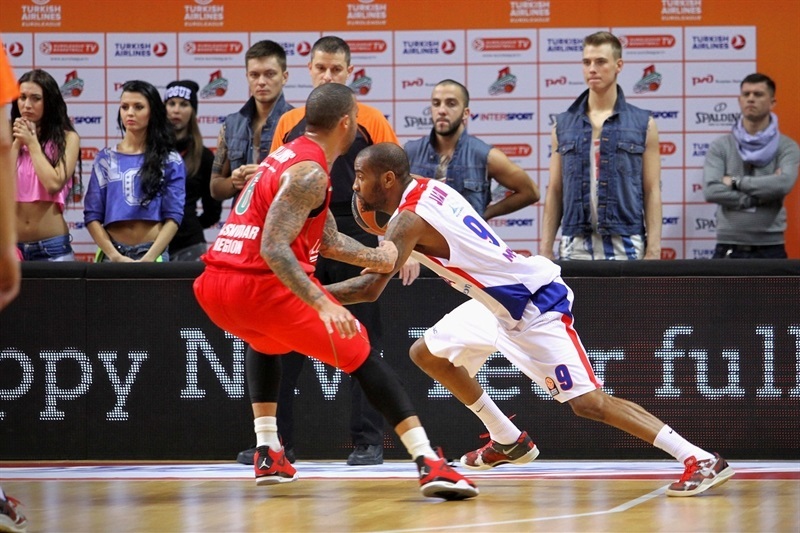 Brown split free throws; Khryapa nailed his fifth three-pointer for a 75-78 CSKA lead. Likhodey returned to the foul line and did not miss this time, but Teodosic restored a 77-80 CSKA edge with 1:03 left. A critical defensive stop by Hines allowed Micov to seal the win with a corner triple, 77-83, allowing CSKA to return home with a very valuable road win. "I'm proud of my team the way we played today. CSKA is a tough opponent and we played with heart against them. We are two defensive-minded teams, who know each other very well, which results in this game being so close and going down to the wire. We had a chance to win this game in overtime, but missed many open shots - and you cannot blame your players for missing open shots. With every game we are becoming a team of a higher Euroleague level and you can see that as now we are able to compete against one of the best teams in Europe. " 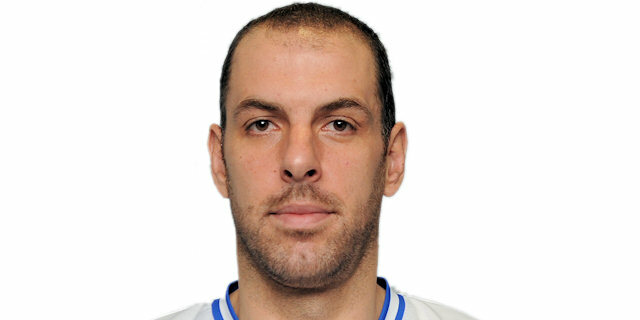 "It was a great game and Lokomotiv was very good. They hurt us a lot in the first half with their pick-and-roll game and offensive rebounding. In the second half we were able to adjust. But if you look at the stats, you'll see how big of an effort we needed to win today - we shot 50% from three, made 24 assists for a team index rating of 106, which is incredibly hard to do. " "It was a very tough and physical game and you can't expect anything else going against CSKA. It was a close game from start to finish as the teams adjusted to each other. I think we lost because we simply couldn't hit open shots in overtime. " "It was a showdown of two very strong Russian teams. The difference between us is that we're proving our status for many years already while Lokomotiv is playing i's first season in the Euroleague. They were full of energy tonight and got a big boost from the young players, Zubkov and Likhodey. It was really hard for us to get this win. "